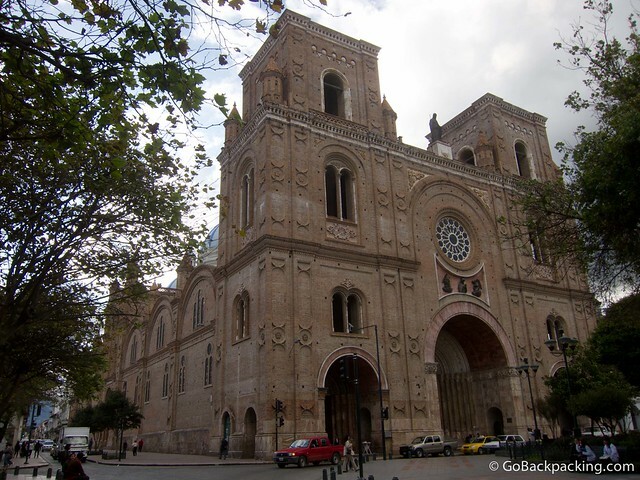 The monumental La Catedral is situated at the heart of Cuenca's historic city center. 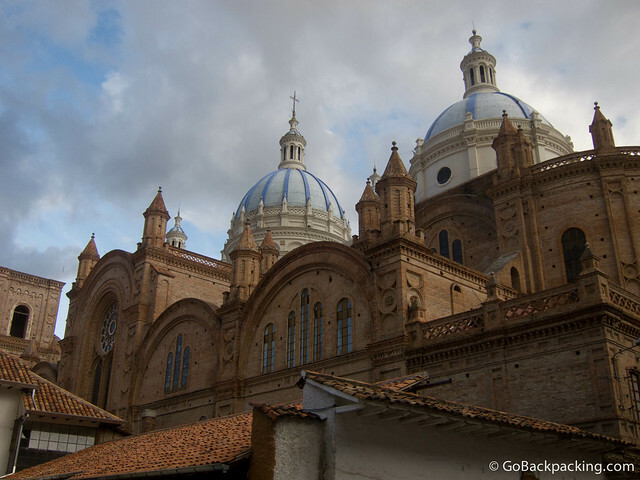 Cuenca may be Ecuador's 3rd largest city, however, with just 450,000 people, it's far smaller than either Quito or Guayaquil and much more relaxed. Situated in the Ecuadorian highlands (2,500 meters above sea level), Cuenca's historic center is listed as a UNESCO World Heritage site. Well-preserved churches appear around every corner, and a monumental cathedral sits at the center of them all. Compared to the major cities, Cuenca is relatively safe, however petty crime still occurs as thieves target tourists. During the day, you can use your camera or smartphone openly around the city center, however take extra care when walking around at night. As a rule of thumb, don't carry anything you're not ready to lose. Cuenca's Aeropuerto Mariscal Lamar is located in the northeast part of the city and serviced daily by flights from Quito and Guayaquil. A taxi ride to the city center is $2. Cuenca's bus station, Terminal Terrestre, is located a few minutes walk west of the airport. Likewise, a taxi to the center costs about $2. Direct buses to/from Guayaquil depart hourly for $8.25. The 3 1/2 hour drive includes a ride over a 4,100-meter mountain pass in El Cajas National Park. The highway is in very good condition, ensuring a comfortable ride, despite the twists and turns. Buses to/from Quito depart throughout the day and night as well. The ride can take up to 10 hours. The pueblo of Vilcabamba in the Valley of Longevity is a favorite stop for those en route to Peru. From Cuenca, take the bus to Loja (5-6 hours), and then switch to a local bus for the 45-minute ride further south to Vilcabamba. Looking up at the Escalinata, which connects central Cuenca with the souther part of the city. Cuenca is a city made for walking. The historic city center can be traversed in 20 – 30 minutes. One way, cobblestone streets keep traffic from moving too quick. Signals at crosswalks also help ensure pedestrians' safety. Cuenca's wide roads ensure plenty of room for bicyclists, though expect a bumpier ride than on asphalt. Taxis are inexpensive and should be taken late at night (after 10 pm) if you need to go more than a few blocks. Taxis are not metered. Get an estimate from a local, and negotiate before entering the cab. $2 – ride to/from bus station or airport. $2 – ride from bars and clubs around Calle Larga (the Zona Rosa) to your hostel. Local buses are useful if you want to visit the outer edges of Cuenca. The average price is about $0.25 per ride. For more info, including bus routes, visit Cuenca Transit. There are tons of hostels located throughout central Cuenca, so you should have no trouble finding a place to stay for the night. The majority of budget options are located along Calle Larga, the city's Zona Rosa. Hostal Macondo (Editor's Pick) – Tarqui 11-64 & Mariscal (5 blocks from the Cathedral). 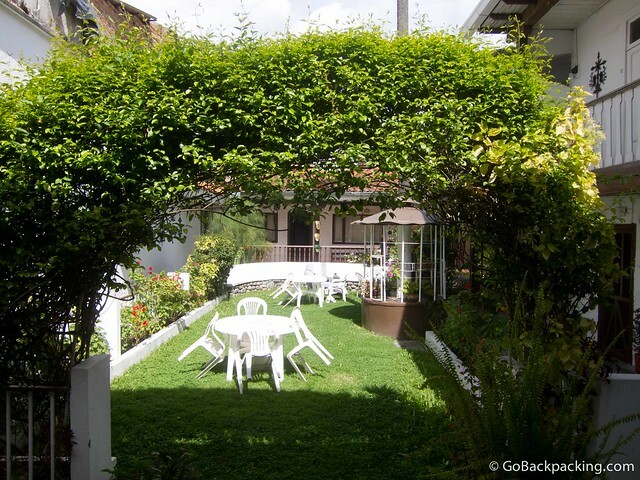 Hostal Macondo is more akin to a B&B than a typical youth hostel. The historic main building features a solarium, while other rooms line the perimeter of a beautiful garden, complete with hummingbirds. Self-service breakfasts are included, with delicious fresh breads, cheese, juices, coffee and tea. Intense, hot showers. Private rooms with shared baths run $19/night. Negotiate a lower rate if you plan to stay a week or more. Good Wi-Fi is available throughout (a bit slow for video). Hostal Turista del Mundo – Calle Larga & Herman Miguel. Good place next to the river, amidst lots of bars and restaurants. Private room with bath for $12/night. Wi-Fi is sufficient, but not great. Posada del Rio – Hermano Miguel 4-18. Private rooms with shared bath for $12/night. If you plan to spend a few weeks, or months, in the city, then you'll want to rent a room or apartment. Your best bet is to either negotiate a long-term rate with a hostel, or ask around for rooms or apartments for rent. The newspaper classifieds offer little information beyond a name and phone number to call. Thanks to its size, and growing reputation as a popular place for expats to hang out or settle down, there's a good Couchsurfing community in Cuenca. The best way to get to know Cuenca is to walk around the historic city center, taking in the sites and sounds of local life, and photographing variety of churches on display. A few hours should suffice, and remember the best natural lighting occurs around sunrise and sunset. In the early evening, you may want to walk past a few churches again to see them all lit up. If you want to take photos, it's safer to walk with another person so that someone can keep an eye on your surroundings. 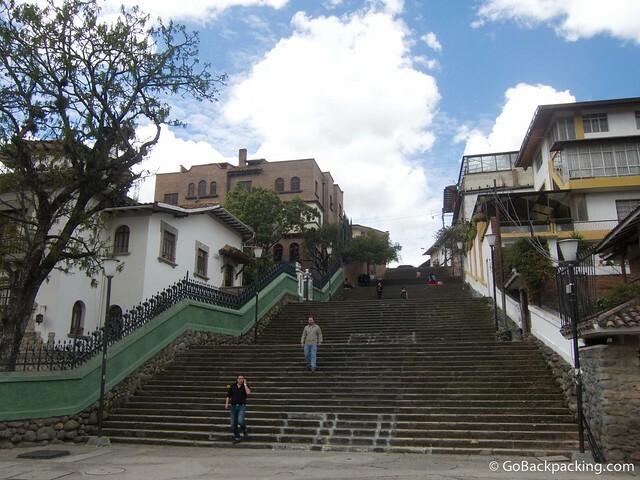 Banos – Not to be confused with the pueblo of Banos further north, this Banos is located just outside Cuenca and features thermal baths ($5) where Ecuadorians go to relax and unwind. Weekdays are less crowded. Catedral Metropolitana de la Inmaculada Concepción – Construction of this monumental, Neo-Gothic cathedral began in 1880, and it took a hundred years to complete. It's topped by 3 large blue and white domes, which are best viewed from the street behind the building. Panama Hat Museum – Calle Larga (look for the big hat on the facade). More souvenir shop than museum, it's still worth a visit because it's 1) free to enter, and 2) interesting to see the old machines used to make the hats (which are still in use). The higher quality hats, which can cost up to $200, are the ones in the glass cases. Ask to try one on and you'll easily be able to tell the difference in material and craftsmanship. The cheaper hats cost $18. Glacially-formed lagoons dot the high-altitude landscape of El Cajas National Park. 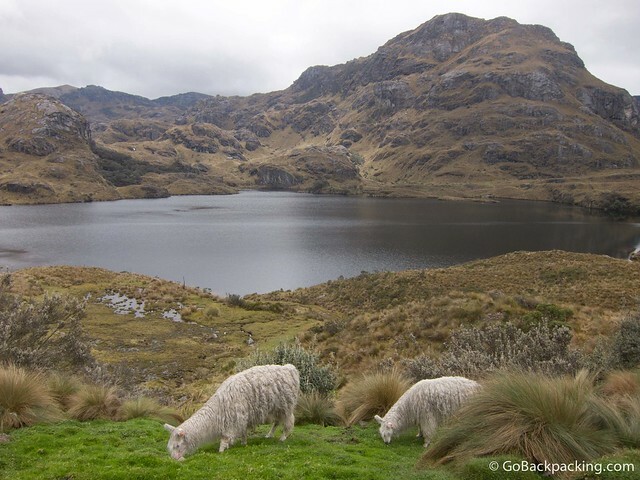 El Cajas National Park (Editor's Pick) – Glacially formed valleys and ponds make up this national park. Hiking trails range from 3,300 – 4,200 meters, with the highest mountain peaks topping off at around 4,600 meters in altitude. Hikes can be done independently, or as part of an organized tour. Apullacta Tours offer day trips with 3 hours worth of hiking for $40 (plus $2 park entrance fee). Includes roundtrip transport, guide, and a delicious lunch at a lodge near the park. Multi-day camping trips are also available. Bring plenty of snacks and 1 – 2 liters of water as it's a late lunch. Chordeleg & Gualaceo – Less than an hour from Cuenca, these nearby towns are known for their artisans and pottery. Ruins of Ingapirca – The largest Canari-Inca archaeological complex in Ecuador is located 2 hours from Cuenca, and can easily be visited independently. Fried trucha (trout) with yuca and vegetables. For a small city, central Cuenca offers a variety of restaurants, from Ecuadorian favorites like cuy (guinea pig) to Pakistani curries and sushi. Ice cream and gelato shops are seemingly available on every corner, especially around La Catedral. Many offer a tasty selection of pastries as well. Don't forget Ecuador is known for its cacao (chocolate) production. Check out this handy chocolate guide from an expat in Cuenca. Canelazo – A warm, rose-colored shooter made of Zhumir (local Aguardiente), cinnamon, lemon, sugar, and water. You can order by the shot, or for groups, by the half or full pitcher. Cuy (Guinea Pig) – Cuenca is known for cuy, and it's the best place in the country to try this unique dish. Locro de Papas – Rich, creamy potato soup with avocado, and optionally, a chunk of cheese too. Trucha (Trout) – Fried trout is a favorite dish, and while native to the surrounding rivers, the one on your plate was probably farm raised. Cafe Austria – Benigno Malo 5 – 95 & Juan Jaramillo. Popular expat hangout with a typical cafe menu of sandwiches, and some higher priced traditional Austrian dishes. Wi-Fi is available. Cafe Euycalyptus – Gran Colombia 9 – 41. Wonderfully restored, expat-owned, two-floor UNESCO-listed building featuring a working fireplace. This bar and restaurant ooze old world charm, and the menu offers a variety of cuisines, most of which are quite well done. Note: this restaurant attracts an older, more mature crowd, so skip the weekly Ladies Night on Wednesdays. Wi-Fi available. Di Bacco Cocina Bar Vino – Tarqui 9-61, in front of Gran Colombia & Bolivar. Excellent wines, Italian food, and atmosphere. Guajibamba Cuyes (Editor's Pick) – Luis Cordero 12 – 32 & Gaspar Sangurima. The best restaurant in Cuenca to sample cuy. This restaurant includes several private dining rooms, as well as two large open seating areas. The walls of the main room are covered in the graffiti and signatures of tourists from around the world (bring a pen and ask your waitress if you can write on the wall too). A whole cuy costs $19, and is enough to feed 2 – 3 people. La Compania Microcerveceria – Borrero 5 – 97. Enjoy locally brewed beers in the middle of the Zona Rosa. La Esquina – Corner of Calle Larga & Hermano Miguel. 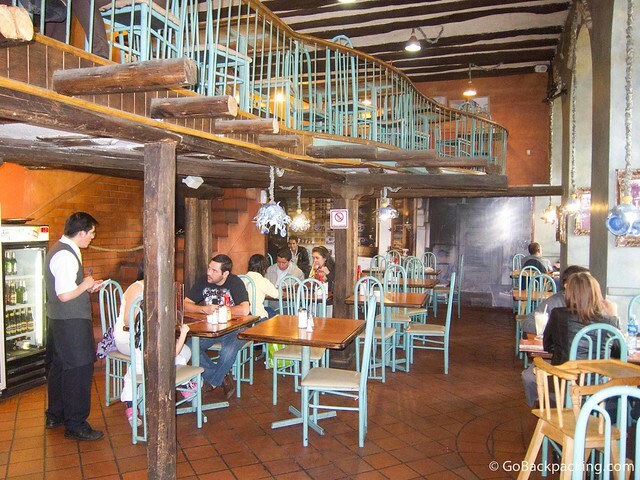 Small Argentinean restaurant (5-6 tables) with good food in a very convenient location. Features an open kitchen. Monday Blue – Calle Larga. A variety of budget-friendly dishes, from shawarma to burritos. Fun interior decor, however, the menu is hard to read, as if it was designed by an overzealous video game player on an acid trip. Raymipampa (Editor's Pick) – Benigno Malo 8 – 59 (adjacent La Catedral). 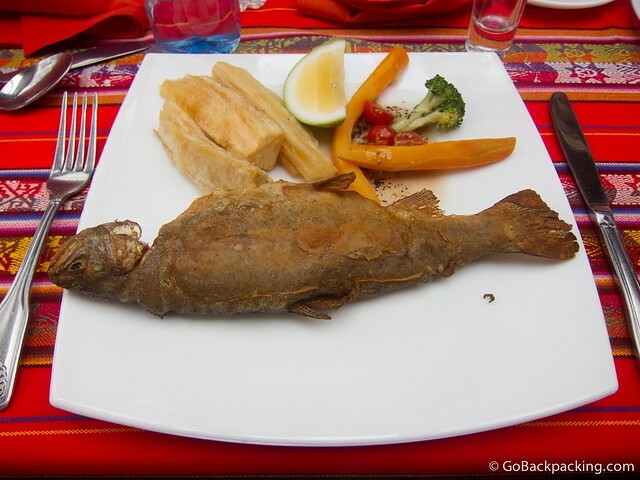 Raymipampa offers a variety of classic Ecuadorian dishes, from fried trucha (trout) to llapingachos (fried potatoes). Busy, but typically good service during the 12 – 2 PM lunch rush. Sakura Sushi (Editor's Pick) – 2451 Paseo 3 de Noviembre & the Escalinata (facing Tomebamba River). Fresh, well-presented sushi at Western prices ($1.50 – $2.50 per nigiri, avg $8.50 per roll). Sakura offers a welcome respite from typical Ecuadorian cuisine. A small patio offers patrons al fresco dining with a view of the river, while a warmer indoor dining room is available for cooler nights. Taj Mahal – Corner of Calle Larga & Benigno Malo. Cavernous Indian/Pakistani restaurant serving up classic curries, though they unfortunately use local white rice instead of tastier Basmati. Hookahs are available for smoking flavored tobacco (shisha), a popular activity for the local kids after school. Tiesto's Restaurante (Editor's Pick) – Juan Jaramillo 7 – 34 & Borrero. One of the best restaurants in Cuenca. Chef and owner Juan Carlos Solano is the kind of guy who will take time out of the kitchen to visit with his diners. Half the menu is devoted to family style dishes which serve a minimum of 2 people, however there are enough options for solo diners, as well as vegetarians. The ambience and service are excellent. Recommended: Pollo con Curry de Macademia. It's divine, and a bargain at just $11.50. Wunderbar Cafe – Hermano Miguel & Calle Larga (midway down the Escalinata). This café and bar offers a large choice of drinks in a warm atmosphere. However, the restaurant menu is small. Salsa dancing at Zoe on a Saturday night. 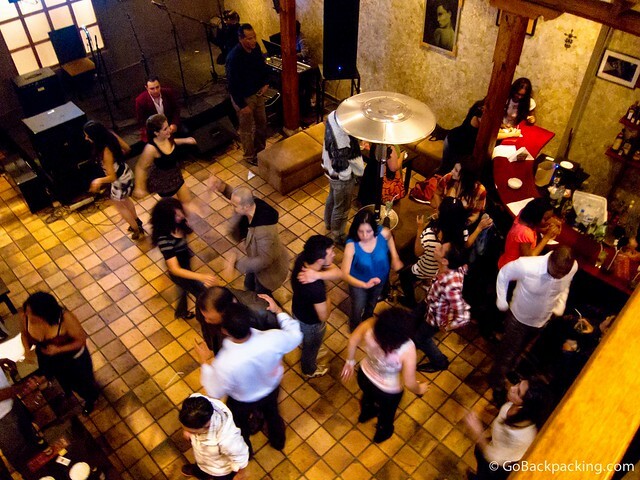 Cuenca offers a lot of nightlife options, from cozy hole-in-the-wall bars to large, modern discotecas. And most are within a convenient five to 10-minute walk from the city center (La Catedral). Due to a recently passed law, bars and clubs stop serving alcohol and close down by 2:30 AM. Cafe Habana – Calle Larga, near the Escalinata. Centrally located salsa club. Cafe Verde, Pinton y Maduro (Editor's Pick) – Borrero & Honorato Vazquez. The best bar for dancing on a Thursday night. Cozy, candlelit atmosphere and great crossover music (salsa, merengue, bachata, reggaeton). Live bands on the weekends ($5 cover). Coffee Tree (Editor's Pick) – Corner of Calle Larga & Borrero. Part of a larger Ecuadorian chain of cafes, the new Coffee Tree location in Cuenca is situated in the heart of the city's Zona Rosa. Outdoor seating (with heaters) offers excellent people watching opportunities both day and night. On the weekends, it's a great place to hang out. Nightly 2 for 1 happy hour specials, and free Wi-Fi available. This café is on par with Starbucks and Juan Valdez. Krak Discotek – Calle Larga 6 – 111 & Borrero. One of the most popular modern clubs in the city, this 3-floor, 700-person discoteca features crossover music. Gets jam-packed on the weekends. La Mesa Salsateca – Gran Colombia 3 – 36 (between Vargas Machuca & Tomas Ordonez). Salsa bar popular with expats and locals alike. The best option for going out dancing on a Wednesday night. Nite Discoteca – located a 10-minute walk from Calle Larga, across the Tomebamba River. Very popular crossover club on the 3rd floor of a mall. Attracts a mostly teenage crowd, with the girls dressed in their best miniskirts and 4-inch heels (think high school dance). Seating is reserved on the weekends. It begins to get crowded by 11 PM, so arrive early to avoid the line. As with many clubs, you'll get a plastic debit card which will accrue your charges for the night. Friday nights have a $10 cover for guys, $5 cover for girls. Beers start at $4. Zoe (Editor's Pick) – Borrero & Sucre. Two-floor bar and restaurant that offers an excellent salsa night on Saturdays. A great mix of Ecuadorian and expat dancers. $3 cover includes one drink. Velvet Discoteca – in a separate, white building adjacent the one with Nite Discoteca, Velvet attracts a similarly young teenage crowd.